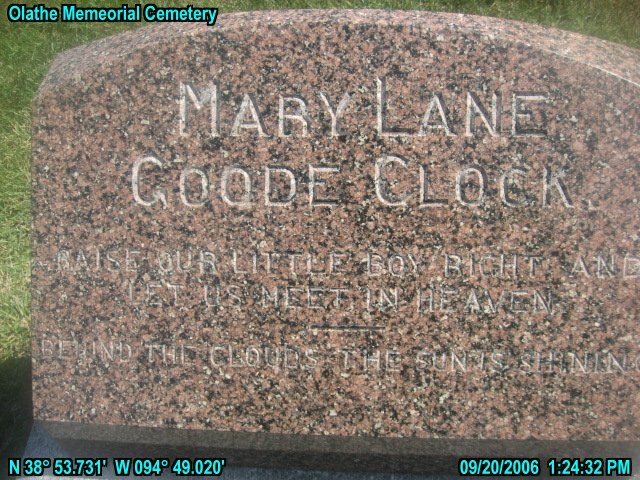 On last Friday evening at 9 o'clock the soul of Mrs. Mary Clock took its departure for that world of which God is the glory and where sorrow fills no eyes with tears. The entire community was moved to grief as the intelligence of her death was passed from friend to friend and neighbor to neighbor. She had been seriously sick but two or three days. A very sad fact in connection with the event was the absence of her father and mother. Dr. and Mrs. G. T. Goode, who were in California where they had been spending the winter on account of Dr. Goode'e health. Unfortunately they had just left Long Beach for Portand Oregon, and were the waters of the Pacific before the sad message could be communicated to them. Every effort was made to get in communication with them and for three days the terrible anxiety pressed upon the hearts of the waiting grief-stricken friends and relatives. Fortunately their vessel was found at its first landing place, Santa Cruz, California, where the father and mother first learned that their beloved child had fallen asleep. They telegraphed from there that they would take the first train for home and are expected to arrive in Olathe sometime Thursday morning. On Tuesday, at 2 p. m., as the sorrowing parents were hastening homeward on their sad journey, the people of Olathe assembled at the Christian church to pay their last tribute of respect to her, whom death had so unexpectedly called from earth. Kind hands had beautifully decorated tbe church with many flowers and the large audience, silent with sorrow, listened to the sacred songs, to the earnest prayers, the word of God and the eloquent sermon with hearts as touched by a common grief. The services were conducted by Rev. J. S. Ford and in the following order: 1. Organ prelude; 2. Song; 3 Prayer by Rev. J. G. Henderson, pastor of the M. E church; 4. Sone; 5. Reading of the-90th Psalm, by Elder Luthei Moore, pastor of the Christian church; 6. Song; 7. Reading of obituary by Rev. J. S. Ford; 8. Song; 9 Reading of scripture by Rev. Randolf; 10. Song; 11. Sermon by Rev. J. S. Ford. Throughout the services were simple but impressive. The sermon was a beautiful tribute to the beautiful life which formed its theme. The many flowers gathered together, and the large number of sacred songs were all provided at the request of her whose spirit in triumph had entered the Gates of Paradise, to behold the unwithering flowers of God and to hear the anthems His angels sing. 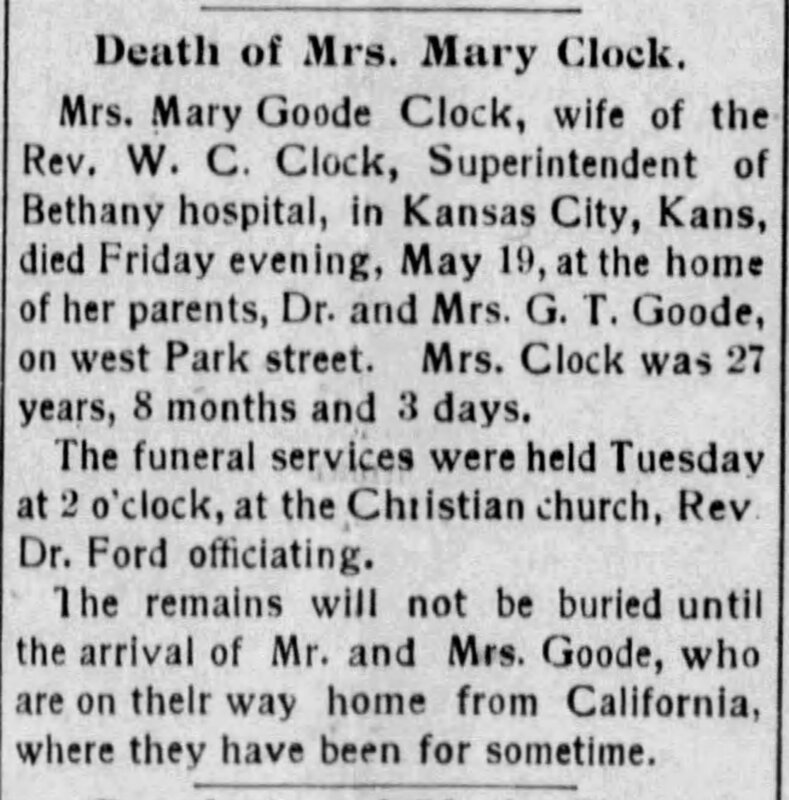 Mrs. Mary Clock was 27 years, 8 months and 3 days on earth when she fell asleep. She leaves to mourn her loss, a husband and child, a father and mother, a brother and sister, besides a very large circle of friends. She was born near Lenexa. Johnson county, Kansas. After graduating from the Olathe High school, she attended and graduated from the State University at Lawrence. Soon afterward she was united in marriage to Rev. C. W. Clock, a minister in tbe M. E. church. She obeyed her Saviour in the Christian church in this city, April 8. 1891. Now she rests in Him, while her ransomed spirit rejoices in the gift of His love - eternal life. The work which follows her falls in rich benediction upon all who knew her and the marvelous triumph of her life and faith shall for generations continue to point weary pilgrims to Him who said: "Be of good cheer, for I have overcome tbe world." Please share your memories of Mary Lane.